One of the more frustrating things you will run into when building a Raven Guard Legion is the lack of uniformity in tactical markings during the time of the Horus Heresy. In addition, there have been a couple confusing example put out by GW along the way. I'm putting this thread together to try to save some of my fellow XIX Legion generals some head ache. In the Index Astartes books of yore GW actually put out some suggestions or preheresy vs post heresy tactical markings. At the time, it created all sort of Jamaican Rasta looking armies as fans started to paint all tacs in green, fast attack in red, etc. This is still a throw back fan concept for some who like the look. 10th Comapny = Scout Company is usually white, but it's displayed on them individually because they are scouts are usually in camo. 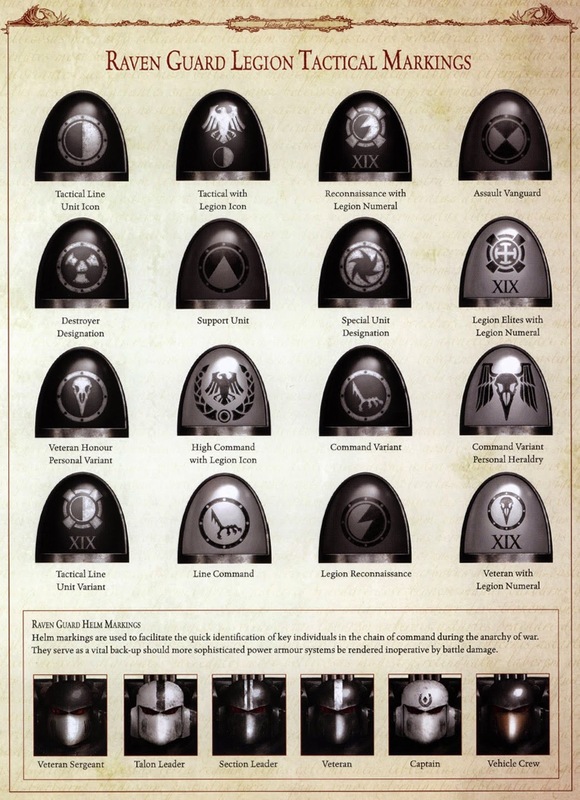 Additional, confusion from this image comes from the fact that Legions have lots of Chapters (1000 Astartes), which are broken down to 2 Battalions (500 Astartes each). Each Battalion has 5 Companies with 100 marines, each broken down to squads of 5 to 20. 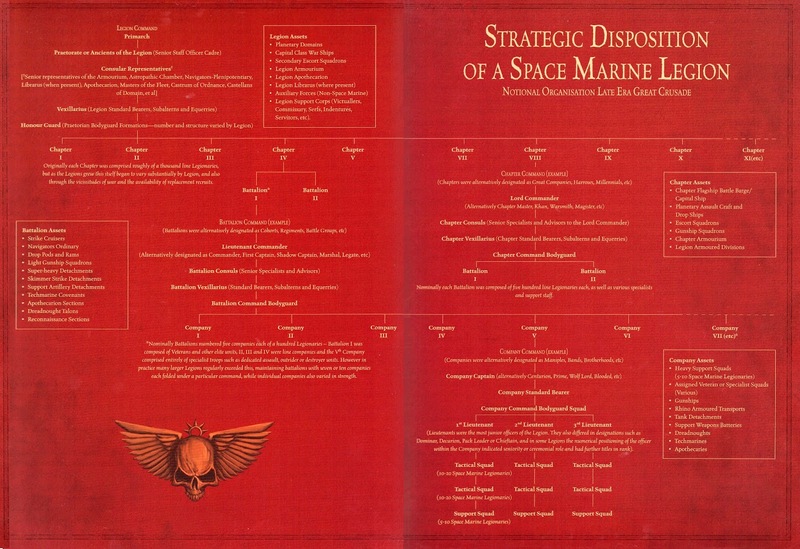 In 40K, the space marine chapters are a Company strong. 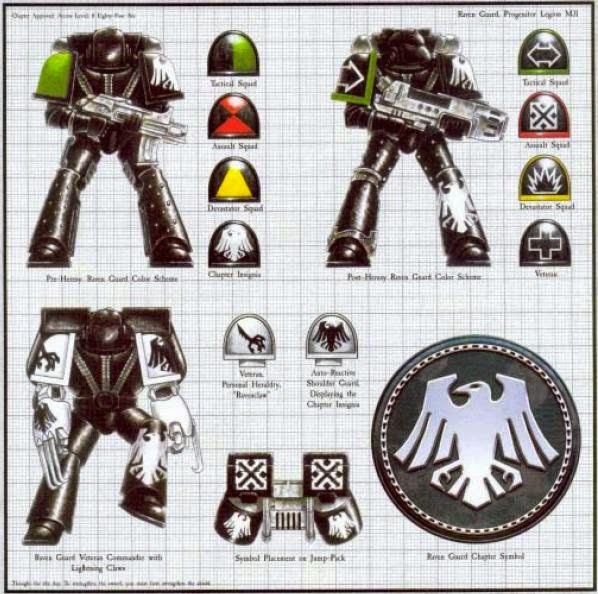 The most recent artwork put out by Forge world, removes the concept of trim color across the board, and gives examples with black or silver trim as you can see in the following examples. 7th Battalion (Right Knee), which actually denotes him of the pre-Corax unified Raven Guard. 31st Shadow Company (left knee) which is directly under legion command, stead of serving in line, MKIV recon armor, which is turned off, which is why it's almost black. So technically their armor literally goes to camo mode. The Terminator below, is part of the first Battalion in the 5th Chapter in an assault company. Forge World also put out shoulder pad tactical markings. Which are very cool but kinda ambiguous, as they don't exactly line up with squad types across the board. Although it is nice that they at least match the index astartes should pads, minus the color. Vet Sergeants have white faces, and the more senior you are the more white you have on your helmet, as seen in the Talon Leader and the Captain. Shoulder pad rims are either black or silver. Raven Guard markings started after Corax joined the legion. Company, Chapter and Battalion Markings are used, but not very uniformly. Squad Type is designated on the knee pad or the shoulder. Squad markings aren't used and are named after their Sergeant. Finally, it should be mentioned that Raven Guard will often fight in stealth markings so as not to have their leadership easily identified, so feel free to throw a lot of this out the door is you like. Pre Corax Raven Guard: See armor #2. The XIX Legion was created from the Terran Xeric Tribes which came from the Asiatic dust plains during the unification war. They wore grey armor and fought a lot under Horus and the Luna Wolves. They had a reputation for being cold blooded and acted as oppression, repression and occupational forces. They were known to wear war paint made from Asiatic dust and were referred to as the "Pale Noma" and the "Dust Clad". When Corax took over the Legion they reminded him of the slaver of Lycaeus, and thus he reassigned many of the Terran based Legionaries, including Shade Lord Akrhas Fal to the fringe of the Imperium as Predation fleets or Charcharadons, which would become space sharks chapter that is covered in the Babdab war. Pre Drop Site Massacre Raven Guard: Raven Guard were one of the smaller legions at the time of the Great Crusade. They had 80,000 marines at the time of the drop site massacre, which mean they had ~ 8 Chapters, 16 battalions and 80 companies. So if you are doing markings I would stay with those confines. Post Drop Site Massacre Raven Guard: About 3,000 Raven guard escaped the Drop Site Massacre, and their total fight force was around 4,000 Astartes all together. Corax reorganized his remaining forces into 3 divisions based on combat specialization. Solaro An is also interesting in that he the youngest command, being that Corax brought him from Deliverance as a child. He is killed at the drop site massacre and replaced by an Alpha Legionnaire. So you could totally play this as a traitor Raven Guard force. Nuran Tusk: Replaced Solar An as commander of the Hawks only to be killed, a few weeks later, during the assault on the perfect fortress. Soukhounou: Became the commander of the Hawks for the rest of the Heresy. He was Terran born. Raptors: Corax also tried to bolster his ranks with pure Primarch gene seed that the Emperor gave to him. This made a splice of Astartes and Primarch called "Raptors", which were unleashed on the Word Bearers under the command of Branne Nev who was also the master of recruits. Branne Nev was the commander left behind to protect Deliverance. He came to rescue what was left of the Raven Guard after the Drop site massacre and thus saved the Legion. The new Legionaires created after the massacre eventually became the Raptors Chapter. I'm personally still trying to figure out what vintage Raven Guard I am painting. That said, I'm going with the index astartes shoulder pad markings, but I'm doing them in white. I also want to use them in the 40K universe, so I'm using small amount of red indicators to denote the 3rd company. I'm also doing squad markings on the right knee and left shoulder pad and leaving the right shoulder pad for the Chapter Raven. I'm also try not to make them too white, as i want them to feel stealthy, unless they are assault troops or terminators which seem to be unleashed more as a shock troopers. Anything I missed? What have you guys decided on for you Raven Guard? "Raven Guard were one of the smaller legions at the time of the Great Crusade. They had 80,000 marines at the time of the drop site massacre, which mean they had ~ 8 Chapters, 16 battalions and 80 companies. So if you are doing markings I would stay with those confines." It was actually the smallest Legion at the time of the Heresy, locking all other Legions down as being 82,000 or over. The Legion size was 81,000. 1,000 remained behind at Deliverance while the rest went to Isstvan. However, there are an unknown number of nomad predation fleets consisting of an unknown number of XIX Legionaries in addition to Corax's Raven Guard. It is noted that Corax never seeks them out, not even now. 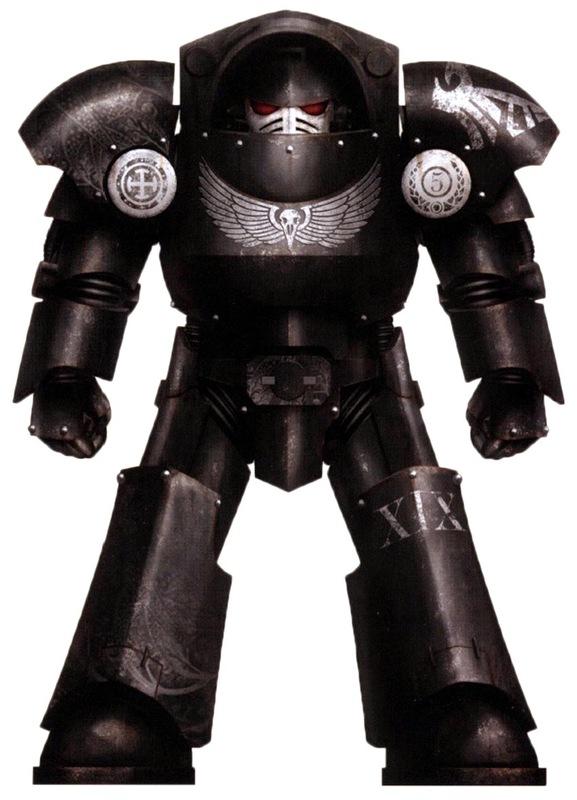 About organization, FW has it that the Raven Guard (seemingly unique of all Legions so far) has remained truest to the original Terran model. Their only distinction that their dependence upon smaller units for unconventional warfare meant that they more identified with their Companies than Chapters or Battalions, but they did still exist. The Terran model had Chapters of 1,000, Battalions of 500, and Companies of 100. The 10,000 strong Chapters mentioned likely comes from the Ultramarines, but it is their own unique Legion structure. Which means 81 Chapters, 162 Battalions, and 810 Companies, though of course I would refrain from using those numbers as rules. No Legion seems to be perfectly organized according to even their own personalized structures. Sources are pgs 137-138 of Extermination. With their preference for Companies as the primary unit for engagements, a Section Leader could be in command of a Battalion or Chapter, leading a whole 'section' of a battle. Or it could be a higher rank to the same effect, placing an officer as having operational command over entire Chapters.